Okay, seriously! One of these days you are just going to have to try these little delights! A perfect light and sweet treat for summer! 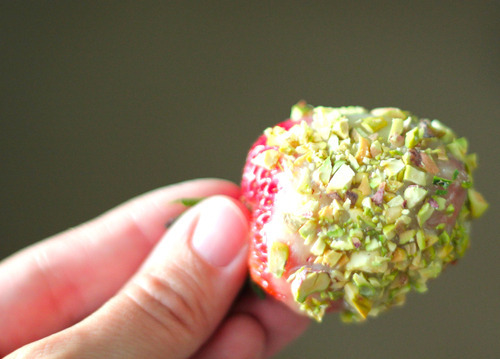 Oh how I love pistachios, lime curd and strawberries all by themselves…put the three together and it is magic! Zest limes and mix zest with sugar. Squeeze limes to get 1/4 cup juice. Set aside. In bowl of electric mixer, cream together butter, sugar and zest. Add eggs 1 at a time, beating after each addition. Add the lime juice and mix. Pour mixture into a medium saucepan and cook over low heat, stirring constantly, until thickened. About 10 minutes. Store in clean container in fridge. Let cool completely before dipping strawberries. Shell and chop pistachios. It’s time consuming so if you can find them already chopped, awesome! Dip strawberries in lime curd, chopped pistachios and enjoy!